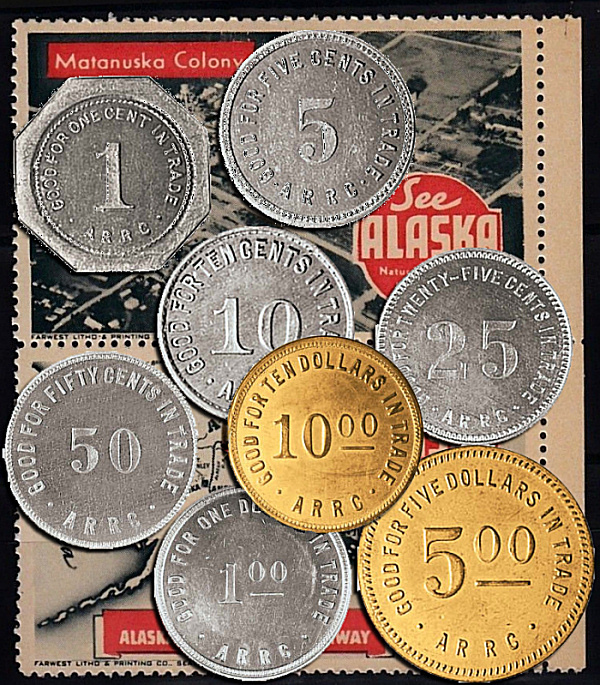 The Bingle is distinguished from the plethora of Alaska tokens issued by Stores, Bars, Roadhouses and other private concerns in that the value of the private tokens was dependent on the merchant., whereas the Bingle was a US Government issued token redeemable for US currency of equal value. 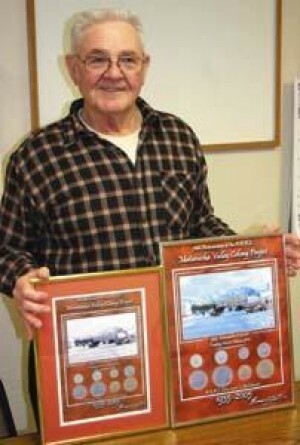 The tokens were issued by the U.S. Government to members of The Alaska Rural Rehabilitation Corporation. Each adult got $30.00 and each child got $5.00 to spend in the ARRC Commissary and store in Palmer. 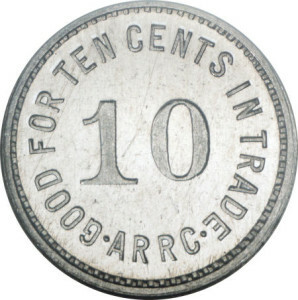 The ARRC tokens were not well received by the colonists and the experiment ended the next year with all of the tokens being recalled. Bingles were given legal tender status. In 1937 The government stopped issuing Bingles and began redeeming them for Federal coinage. In 1938 they revoked the legal tender status of Bingles and melted most. 200 sets were preserved and however many were kept or lost, the rest were melted down. It is my consideration that perhaps the Bingles were seen as a restriction on free trade as the Colonists would not be capable of dealing with anyone but the “Company Store” if all that they got paid in was a currency of only localized value. I tend to think that the name Bingle came into favor long before the ARRC tokens and it was just a happy coincidence that there happened to be a Minister by the same name in the same place at the same time. 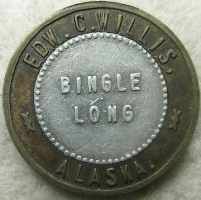 Or that with his being there and “Bingle” already established as a moniker for tokens in Alaska it was natural that they were called such. As of 2014 the value of a full set of mint condition Bingles ranges from $1500.00 to $5000.00. Individual smaller denomination circulated tokens can be found for $20.00 and up. The tokens were minted at The Osborne Register Co., which changed it’s name in 1947 to The Osborne Coinage Company, Inc., the firm started as Z. Bisbee Co. in 1848 and is America’s Oldest Private mint. 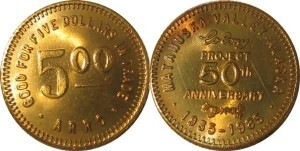 The $5 and $10 tokens are brass and are larger than their gold counterparts, the $5 and $10 gold coins which had been withdrawn from circulation under The Gold Reserve Act of 1934. The 1¢ denomination is also odd sized. All others are the same size as the corresponding U.S. coin. They bear the same imprint on both the obverse and reverse. In 1980 the Alaska Rural Rehabilitation Corporation, then still in existence, published a collection of photographs of the Matanuska Valley colony of 1935, taken by the official A.R.R.C. photographer, Willis T. Geisman. Reverend Bingle is mentioned in the book as a civic leader who started the 4-H club and led fishing expeditions during the salmon season, both for recreation and for home canning of winter provisions. Nothing is said about connecting Rev. Bingle to the tokens. In Ronald J. Benice’s Alaska Tokens there are three bi-metal pieces listed as Chatanika 1.A, B, C, issued by Bingle Fritz. He is identified as Thomas Frederick (Fritz) Welch, operating there between 1914 and 1923. "In honor of the 70th anniversary of the Matanuska Colony Project, a special commemorative print is being released that features art from the great-grandson of Don L. Irwin, who helped establish the project. Norman Odsather's print depicts the Colonists at the trading post. The framed print also has open slots where people can put "bingles," the currency issued to Colonists at the time. Another version of the print has the bingles printed on it." "Each Colonist was issued $30 in bingles, and $5 for each child, so that there would be no open charge accounts at the co-op trading post. In 1985, in conjunction with the 50th anniversary of the Matanuska Colonist Project, reproduction coins were restruck from the original dies, which were found in Washington by James Tapscott." "The tokens came in eight denominations. The one-, five-, 10-, 25- and 50-cent pieces and $1 tokens were aluminum, and the $5 and $10 tokens were brass. Today, a complete set of original ARRC bingles would go for about $675 if in good condition, Roy Brown of Roy's Coins said a couple years ago. Brown said there were various other tokens produced in Alaska, some which have become collector's items. But the ARRC token is the most famous and rated in most coin books because of the Matanuska Colony's prominent place in the history of the New Deal era." Portions Copyright © 2005 The Numismatic Bibliomania Society.